Mothers just have a natural instinct when it comes to protecting children. It is in our genes. Grandmothers are no different, in fact they probably feel the need to protect us, even more so. The worst nightmare for any mother would be for someone to take their baby away from them. 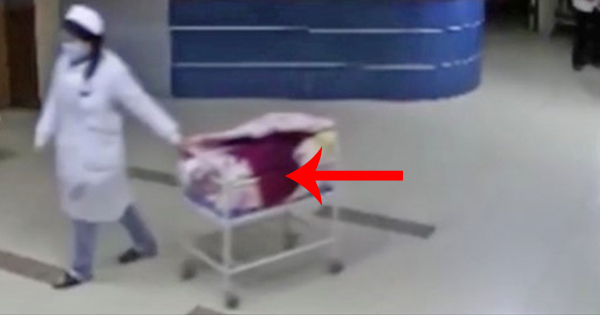 In this video you are about to see we watch as a woman in a Chinese hospital disguises herself as a nurse to get her hands on innocent babies. This is a tactic often used in kidnapping trades. The security cameras caught the whole thing on tape, and I almost cried watching it. A woman known as Su, is seen trying to push a newborns cot away. Luckily, in this case Grandma was there to save the day. She noticed that the nurse was acting extremely suspicious and thwarted her plan to steal this innocent child. Grandma is stealthy in her approach, she follows Su, and just as she is about to get in the elevator with the newborn the Grandma hurries in. She pulls the cot away from the kidnapper and quickly gets off at the next floor. Su tries to get away, but she was detained by the police shortly after the incident occurred. The kidnapper had stolen a uniform out of one of the nurses locker, and if Grandma hadn’t have been watching like a hawk, who knows what would have happened. Hats off Grandma you are a hero! See the shocking footage below and SHARE if you know your grandma would have done exactly the same! We love you Grandmas keep up the good work!